The pale green backstitch is all in metallic DMC Jewel effect 703. The flowers on the hat are straight stitches over a cross stitch in 1 base. 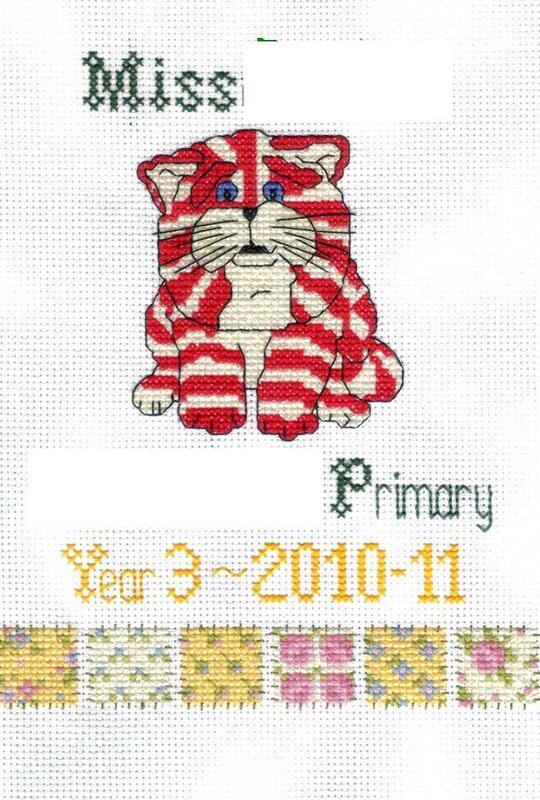 The Bagpuss chart came from an old edition of Cross Stitcher magazine (Aug 2002) and the nice little border was from a more recent issue. Alot of people have been criticising the magazine just lately for being more about sewing and craft rather than straight cross stitch. Personally I would rather see more needlework if they want to diversify rather than sewing and felt craft. I have found there are less projects I want to stitch and the free gifts are not really me but it is useful as a "design library". This is not a very good scanned picture so doesn't do the patches justice. I want to hug this baby, he's so cute! Your Baby Swing is just adorable. Love it. Baby swing is precious! I love all that green! Wow oh wow - two beautiful finishes! What is the plan for the baby on the swing? 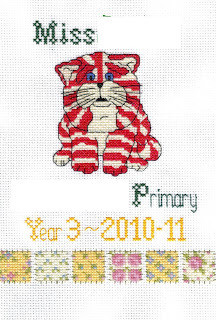 I love the patch border on your Bagpuss piece. I think that the teacher will be thrilled; it is such a nice and personal gift. The Baby Swing is a present for a friend who has just had a baby. I am a very selfish stitcher and only stitch things I like. I choose the chart first then it's a case of finding the right person to stitch it for! She will love this I know. She has just started stitching herself thanks to me so I didn't want to do a traditional sampler which she could easily do herself. I wanted something really special which would challenge me. She's a lovely person who does alot for other people and adores her three children. I love her dearly even when she reminds me I'm only 5 years younger than her Mum! I'm planning on framing it in a simple brown wood frame without glass as the chart gives instructions to add little bells to the swing. Glass would also spoil the ropes and lianas as it would flatten them. I know what you mean about Cross Stitcher, I have to admit that I actually gave up my subscription a few months back because I wasn't enjoying it anymore! 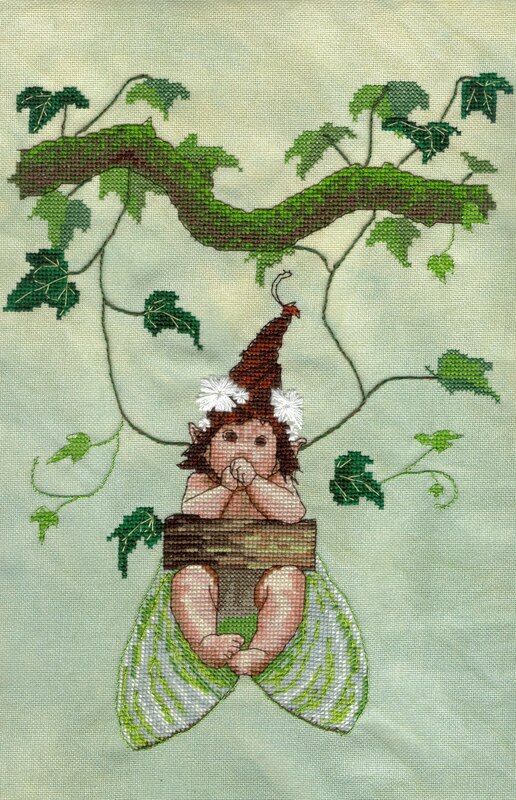 Baby swing just keeps looking better, your stitching on this is just lovely. I like Bagpuss as well! Great stitching on both! Love the little patches under the Puss. Awwww, she has flowers in her hair!!!! How cute is that??? I neglected to mention this in the previous post... but I looooove that moss on the tree trunk. Cute finish for your boy's teacher. :D She's going to love it. This is the cutest design I have ever seen. Its just lovely and the greens are so pretty. Can't wait to see the finish. I am so happy that I found your blog. I have to admit that I was drawn by your clever nickname. He's cute. I have Nimue's Victoria ready to stitch, but don't know yet when to start her.